“Would you like to join us at our beach house in Mexico in November?” Being from the upper Midwest in the United States, we didn’t need to put too much thought into the decision before accepting the generous offer. The thought of escaping to warm sunshine and sandy beaches while enjoying a cold cerveza or margarita surely was preferable to November in South Dakota, with the potential for early winter snow and bitter cold. So, we were headed south of the border, but where exactly was this Los Barriles place and what else were we going to do besides lounge in the sun and enjoy some good Mexican food? All it took was one trip, and Los Barriles became one of our favorite destinations. The village of Los Barriles (“The Barrels” in Spanish) is located in the Mexican state of Baja California Sur, which encompasses the lower portion of the Baja Peninsula. The Baja Peninsula is bordered on the west by the Pacific Ocean and on the east by the Sea of Cortez. “Land’s End” is the southernmost tip of the peninsula, and that’s where you’ll find the famous resorts of Cabo San Lucas. The village of Los Barriles lies north of Cabo on Baja’s East Cape, an area along the Sea of Cortez that stretches from Punta Pescadero just north of Los Barriles to basically the eastern edge of the city of San Jose del Cabo. Visitors to Los Barriles have a few options to get there. Choose between flying in to San Jose del Cabo (SJD) or La Paz (LAP), as Los Barriles is between the two cities. SJD is a bustling international airport, with international flight connections to many cities in the United States, Canada, and beyond. LAP is a smaller airport, servicing mainly other cities in Mexico which might work if you are connecting in Mexico City, for instance. Los Barriles is approximately an hour’s drive north of the SJD airport, and a bit further than that from the LAP airport. Both airports have rental car agencies, or you could choose to take a private shuttle to Los Barriles. The final option, if you’re the adventurous type and wishing to take a good old road trip, would be to drive yourself from the U.S. border down the Baja Peninsula. From the California border, it’s around 1,000 miles to Los Barriles. No matter how you arrive, here’s what you’ll find around Los Barriles and the East Cape area. Unbelievable natural beauty where conifer-covered mountains give way to the cactus-specked hills of the desert before sloping down to flat white sand beaches that meet the blue waters of the Sea of Cortez. The climate of the region easily qualifies as a desert, receiving less than 10 inches of rain annually. However, during autumn it isn’t uncommon to receive a downpour that brings the plants of the desert to life. Weather averages are around 80 F during the days except for June, July, and August when temperatures can get up to 100F. Lows are in the high 50s F to mid-70s F (June, July, and August) at night. In the winter months, it can be quite windy which actually is a draw for some as you’ll see in the activities listed below. Aside from nature’s splendor, you’ll find Los Barriles and the East Cape area to be quite a departure from the hustle and bustle of Cabo San Lucas. If you prefer to be away from mega-resorts, night clubs, and busy highways, you’ll likely really enjoy the slower pace found in the smaller villages along the East Cape. 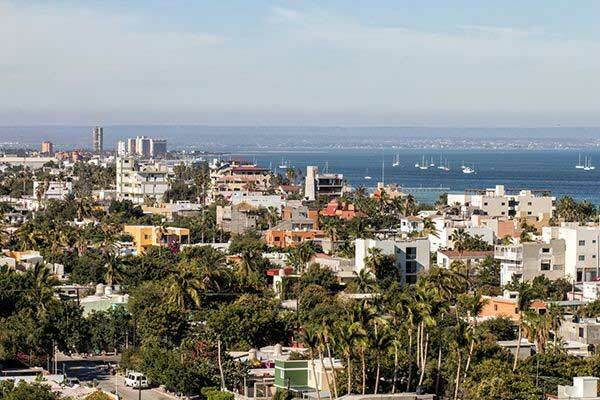 Aside from the few thousand residents of Los Barriles (roughly half of which are full- or part-time expats), the other small villages of the East Cape include Santiago, La Ribera, and Cabo Pulmo. Los Barriles has the most services of these small communities, and you will find a full-size grocery store, fresh tortillas at the local tortilleria, and if you didn’t have any luck on the water, fresh fish at the local fish market. Dining options include everything from fish tacos under a shady palapa to pizza joints to gourmet cuisine served on linen-covered tables. Two banks with English-speaking staff, two gas stations, medical and dental clinics, hardware store, and veterinarian are just some of the services that make this an easy place to visit or live. Options for short- or long-term lodging range from oceanfront hotels to plenty of vacation rentals in all sizes and price ranges found via Airbnb or other booking services. Whether you’re traveling solo, as a couple, or with a large group, you’ll be sure to find something in your taste and budget. Given the proximity to the desert and the Sea of Cortez, you’ll not be short of things to do in and around Los Barriles. Starting on land, you can hike, ride mountain bikes or ATVs, or even horseback ride through the hills. Look for the estimated 125 species of plants found in the area, including the giant Mexican cadron cactus. These impressive desert sentinels can reach up to 30 feet in height, although individual specimens have been observed at twice that height. With branches that are sometimes as large as the primary trunk, this cactus can weigh as much as a whopping 25 tons. Bird watching is a popular activity, and there are six species endemic to the area—including the adorable Cape Pigmy Owl. On the water, you’ll have access to what Jacques Cousteau referred to as the “aquarium of the world”—the Sea of Cortez. Sport fishing is extremely popular out of Los Barriles, with anglers heading out to pursue marlin, sailfish, tuna, mahi mahi, roosterfish, wahoo, and more. In fact, the East Cape is one of the best places in the world to pursue roosterfish from the beach. On our visit, I was able to land my first billfish—a striped marlin just shy of 100 pounds—and we also enjoyed meals of fresh mahi mahi that we caught ourselves. For those wanting to get in the water and up close with marine life, you’ll find some incredible experiences on offer. We took a day trip up to La Paz, where we snorkeled with the huge but docile whale sharks—ticking off an item from our bucket list. South of Los Barriles, you can visit the Cabo Pulmo National Marine Park to snorkel and scuba dive among the northernmost coral reef in the eastern Pacific Ocean. You can see sea lions, sharks, rays, sea turtles, and a huge variety of tropical fish in these protected waters. Sea kayaking and paddle boarding are popular activities on the often-tranquil waters of the Sea of Cortez. However, as noted earlier, the winter months can get quite windy, which is when you want to give kite boarding a try. The winds are so good and so consistent that Baja’s largest international kite boarding exhibition and competition was held off the beaches of Los Barriles for several years each January. Of course, if you’re not inclined for these more active pursuits, Los Barriles and the East Cape allow plenty of chances to take leisurely strolls on the beach, find your inner Zen in a yoga class, or simply relax in a hammock while gazing over the serene Sea of Cortez. This area truly has something for everyone, and we cannot wait for our next visit.